What is ALCXMNTR.EXE? Should I remove it? 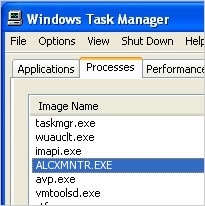 ALCXMNTR.EXE (also known as AlcxMonitor) is an executable process of RealTek audio drivers. This file is typically located in a subfolder of “C:\WINDOWS\” and has been known as a necessary part of the Realtek drivers. In order to avoid problems with sound, you shouldn't terminate this process. Note that you may find ALCXMNTR.EXE on your computer even if you didn't install RealTek audio driver on it because this company has been making built-in sound processing hardware for other companies as well. If you feel that ALCXMNTR.EXE is initiating problems on your computer, you can terminate it. It's not an essentially Windows process. Any malware can be named anything, so beware that ALCXMNTR.EXE may also be involved in malicious activity. Hackers may decide to use the name of this file in order to hide their viruses. If you want to check the trustworthiness of ALCXMNTR.EXE and make sure that it's not malicious, use RegCure Pro. Opisz plik ALCXMNTR.EXE. Czy go potrzebuję? è ALCXMNTR.EXE un file sicuro? ¿Cuál es la función de ALCXMNTR.EXE? This entry was posted on 2014-02-27 at 07:34 and is filed under Application files, Files. You can quickly scan the QR code with your mobile device and have ALCXMNTR.EXE manual removal instructions right in your pocket.